Pharmacy technicians assist pharmacists in the medication delivery process. 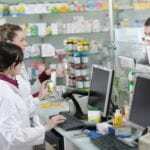 As the profession evolves and places additional demands on registered pharmacists, the roles and responsibilities of pharmacy technicians will also increase. Pharmacy technician training programs produce graduates who are able to support the pharmacy’s clinical efforts, freeing pharmacists to practice at the top of their license. 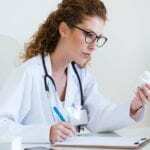 Technicians manage distributive functions, such as compounding sterile preparations, administrative responsibilities, and customer service, leaving those tasks requiring clinical judgment to the pharmacist. Common responsibilities include repackaging medications, compounding sterile and non-sterile products, data entry, purchasing and inventory, and billing and insurance. Pharmacy technicians in Illinois earn approximately $29,094 annually. Harper College prepares pharmacy technician students to assume entry-level employment in the high-demand health care industry. The curriculum covers 50 hours instruction to prepare students for success on the PTCB, which is required by the state of Illinois. Students learn IV flow rates, dosage calculations, inventory control, defining drugs by generic and brand names, medical terminology, drug compounding, dosage conversions, and billing and reimbursement to work under the supervision of registered pharmacist in hospitals, community pharmacies, home infusion pharmacies, and other health care settings. Classes meet Tuesday and Thursdays from 6:00 pm to 9:30 pm for six weeks. Applicants must be comfortable performing math calculations. Tuition for the 3.5 credit program is $999 and includes textbook and materials. Students enrolled in the pharmacy technician program at Jethro Healthcare School acquire the essential knowledge and skills to dispense prescriptions under the supervision of a registered pharmacist. The curriculum covers dosage calculations, pharmacology, dispensing medications, medical terminology, IV flow rates, generic and trade name drugs, dosage conversions, packaging and labeling, and billing and reimbursement. Classes meet from 1:00 pm to 5:00 pm on Saturdays or Tuesdays from 5:00 pm to 9:00 pm for 10 weeks. Students will complete 50 contact hours during the program. Applicants must be at least 16 years old and have a high school diploma, social security number, and ID and pass the written admission exam. The total cost of the program is $1070. It includes CPR training, registration, tuition, books and license. Northwest Suburban College prepares pharmacy technician students for employment in clinics, hospitals, retail pharmacies, nursing homes, and home health agencies. The program runs for 12 weeks and includes classroom and lab instruction. Areas of study include pharmacy technology, prescriptions and dispensing, administrative procedures, laws and ethic, and customer service. In addition to classroom and lab, students must participate in an externship at a community or hospital pharmacy where they will conduct the duties is a pharmacy technician under the supervision of a registered pharmacist. Upon completion of the program, graduates will be prepared for success on the PTCB exam for national certification. Applicants must meet with an admissions representative, complete school’s application, and submit official high school transcripts. Tuition for the 12-week program is $1,950. Additional costs include application, background check, uniform, lab coat, CPR, and graduation fee. The Pharmacy Technician program at Chicago ORT is designed for adult learners who want to begin working in the pharmacy or pharmaceutical industry. Students learn pharmaceutical laws, insurance billing, calculations and compounding. Course topics include pharmacy ethics, federal and state regulations, inventory control, purchasing methods, pharmacy equipment and maintenance, operating systems, payment collection, and effective communications. Students must also complete a clinical externship at a community or hospital pharmacy. The duration of the program is 8 months and offers 31 credit hours. Applicants must be 17 years or older, have a high school diploma or GED equivalent, and complete the admission process, including a personal interview and a completed application. Tuition for the program is $11,185. Textbooks cost $385, registration is $100, and books and fees and supplies cost $650.